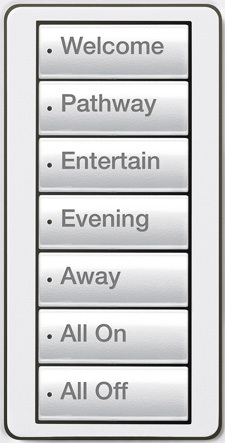 Lutron RadioRA 2 is a wireless total home control system. 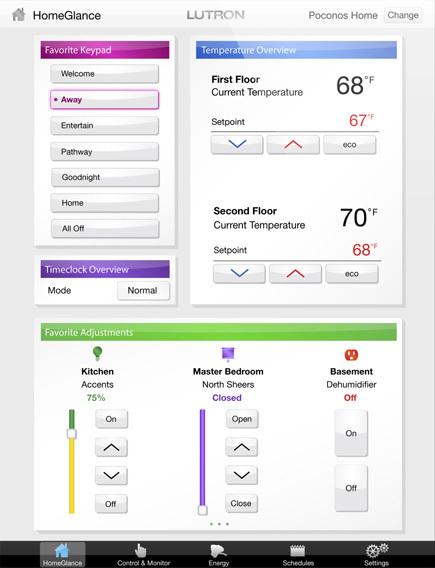 "Total home control" means you can control your lights, window shades, thermostats and appliance standby power throughout your entire home from a phone, tablet or wall-mounted keypad. The "wireless" bit refers to wireless technology that makes it just as easy to retrofit existing homes as it is to install in new constructions. Turn on indoor/outdoor lights before exiting your car. Set lighting timers when home and vacation mode when away. Integration with alarm systems to turn on all lights or flash lights when the alarm triggers. Configure lighting scenes to dim lights and save energy. Turn off all lights from 1 button before bedtime or when you leave home. Occupancy sensors to automatically turn off lights when not needed. Control motorized shades to allow or block sun depending on the season. 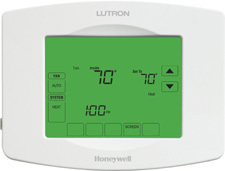 Set heating/cooling schedules and control your thermostats from anywhere. Turn off standby power to appliances when not in use. Eliminate banks of switches that control who knows what. Easily adjust shades, lights and temperature in 1 room or throughout your entire home from your mobile or wall-mounted device. With your mobile device, control everything no matter whether you are home or away. Integration with other systems from other manufacturers, i.e. garage doors, A/V equipment, remote controls, etc. We install Lutron RadioRA 2 systems in the mid to lower Hudson Valley, New York including Westchester County, Putnam County, Orange County and Dutchess County. Interested? Please call us at 845-265-9521 or submit your inquiry here. We look forward to hearing from you and discussing how we can help. Lutron RadioRA 2 for the entire home up to 200 devices. Lutron Caséta Wireless for single rooms or key areas up to 50 devices.